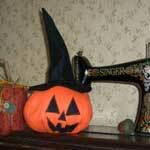 Halloween seems to have been made for sewing! If you can sew, you can make your kids' such unique outfits for Halloween. 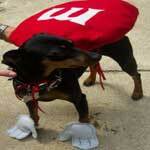 Beyond costumes, there is so much more you can sew for Halloween, all listed below. 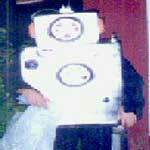 And visit our costume pattern page to find both adult and kids costumes. 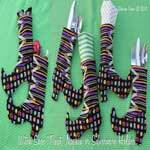 These cool looking witch boots are easy to make and can be used for place settings, filled with candy for gift giving and more ideas. 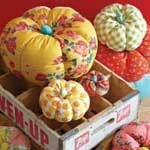 This pattern is in step by step format to help you create a charming fabric pumpkin that will look good anywhere. 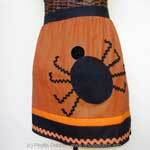 Sew an apron with a large spider pocket using rick rack for legs. You will definitely be apart of the Halloween fun when wearing this scary apron. 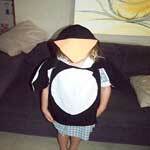 This costume pattern has all you need for making a penguin costume that any little boy or girl would have fun wearing. 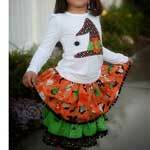 Make this adorable layered skirt with matching top for your little girl to wear on Halloween. 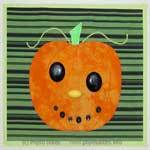 Here is a simple pattern for a placemat that will add to your homes fall and Halloween decor. It's fun to be an octopus! 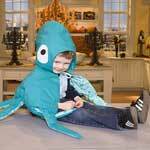 Boys and girls will love stepping out Halloween night with eight arms and a big head & big eyes. 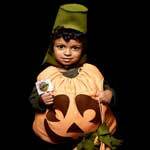 Starting with an orange pillow case and this costume pattern, you can easily turn your little one into a pumpkin for Halloween. 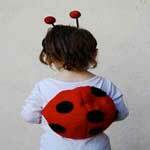 Turn your sweet little baby into a lady bug. This lady bug pattern is so easy, all you need is a white onesie, felt fabric and stuffing. 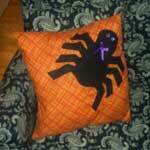 Making a throw pillow is easy and adding a spider to it is even easier. 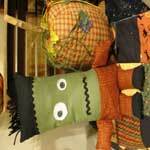 Create a pillow that screams Halloween using this step by step pattern. Make your dog part of the Halloween festivities by making him or her into a cute and colorful M & M.
Get the kids involved in making a cool robot to wear this Halloween. Cardboard boxes and some silver spray paint will get you started. 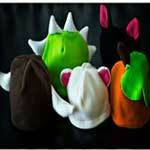 Choose from bear ears, cat ears, an apple, pumpkin or a Viking hat. They are so easy to sew you may want to make one of each. 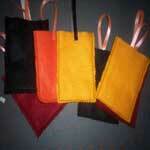 Make your treats at Halloween even more special by placing each treat inside a little felt bag with a ribbon handle. 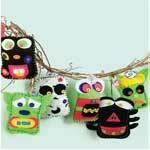 Dated monsters made out of felt each with its own scary face, give kids a fun countdown to Halloween. This Frankenstein doll will put a smile on everyone's face and kids will want him in their rooms, cause he is just that scary cute! 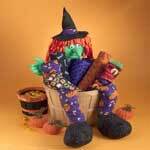 Here is an easy to follow craft pattern for a witch with long arms and legs, plus a pointed nose and a pointed hat. Baby will be sitting pretty this Halloween when wearing this adorable bib you made. This is one bat you will enjoy having in the house. 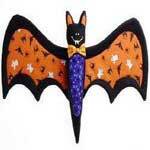 Make this cool bat that can be hung on the wall or attach a loop and hang it on the front door. This isn't any ordinary pumpkin, this is a witch pumpkin with the hat to prove it. 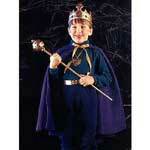 Many costumes require a cape, such as super heroes, vampires, wizards and king & queen. 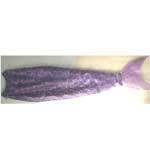 Big girls and little girls alike will love dressing up as a beautiful mermaid this Halloween. 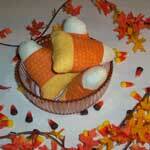 This easy to follow pattern has detailed instructions and pictures for making a giant candy corn for decoration. As if baby wasn't sweet enough, now you can turn him or her into a sweet chocolate chip cookie. 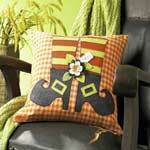 This Halloween craft pattern is for a pillow that doesn't have the whole witch on it, rather just her legs and boots. 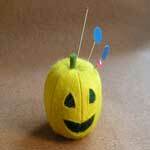 Make your own pin cushion that looks like a little pumpkin, make one for yourself and another to give away. 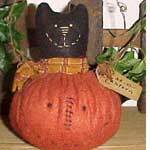 Here is a fun craft for sewing a felt cat and pumpkin with smiles on their faces. Create this cute pumpkin basket with spiders for your little one to collect candy in this Halloween. Want something to hang on the front door or door knob this Halloween? 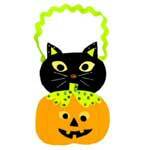 Here is a simple pattern of a jack-o-lantern with a black cat. All you need to make this scary couple are some socks, yarn, buttons, fabric and a little time. Kids love this one! 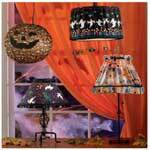 Make the lamps in your home come alive with ghosts, witches, bats and more. 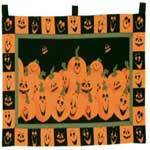 Tons of pumpkins with different facial expression adorn this cool wall hanging. 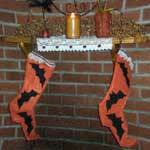 Decorate the fireplace mantle using this unique idea for hanging stockings at Halloween that the kids will love. 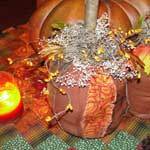 You choose the fabric and prints for sewing pumpkins that make a great centerpiece or to decorate the entry hall table. 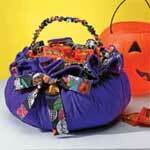 For trick or treating or to keep filled with candy by the front door, this Halloween basket is easy to make. 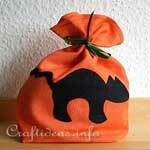 Create this Halloween goodie bag in orange fabric with black cat to give to the trick o' treaters. 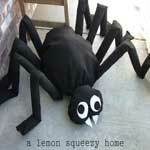 Place this big, scary spider on the porch near the front door to give trick o' treaters fright that's fun! 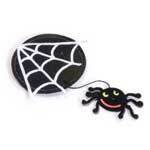 You can easily make several of these cute coasters with a smiling spider and web. 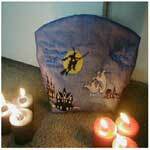 Add to your Halloween decor with this awesome doorstop that has a embroidered witch on a broom, ghost and a haunted house.